For the last 20 years, I’ve suffered from back problems. It started when I was working in a factory and got worse after the birth of my son. When he was 3 months old, I was at the photographers having some baby photos done. I’d taken him in his pushchair and we went on the bus. After having a few photos taken, I went to lay him down for the next one and the top half of my body just seemed to drop down a bit. A pain shot up my back and I wasn’t able to stand upright. I managed to put Aiden down safely then I held onto my back and hobbled to my chair. Not letting the photographer know I was in agony was very difficult. It was very embarrassing and I didn’t want him fussing when he wasn’t able to do anything. I got through the photo session and carefully put Aiden back in his pushchair. I don’t know how I managed to get back to my mum’s on the bus but somehow I did. It took me an hour to shuffle slowly from the bus stop to my mum’s house, a distance that usually took 3 minutes. It was the worst time it could have happened. Not only was I a new mum, just getting used to having this baby, I was a single mum. My mum had been brilliant, helping out with everything but she’d recently had an operation and I was supposed to be going to her house every day to look after her. I ended up having to get my sister to help us both. It was a nightmare. The doctor diagnosed a slipped disc. I spent the next 2 weeks in bed, not being able to move. I dreaded every time I needed the toilet because it meant I’d have to move. As you can imagine, there was no way I could have a bath because I couldn’t get in or out. I didn’t have a shower so for weeks I had to make do with just having a wash.
I’ve had a slipped disc twice but thankfully it hasn’t happened for many years. I do still suffer from back pain, though. I have to take painkillers every night so I can get some sleep. We have both a bath and shower here but I can count on one hand how many times I’ve had a bath. It’s too painful getting in out to make it worth the hassle. I do miss my baths, though. I much prefer bathing to having a shower (unless I’m washing hair!). We need new bathrooms (you’ve probably seen my many posts about my bathrooms before!) and hope to get them next year if funds allow. I’ve been looking at walk-in baths from Bathing Solutions. It would be wonderful to be able to have a soak in the bath again and not be nervous while I’m there that I’m not going to be able to get out. Please note: This is a collaborative post. 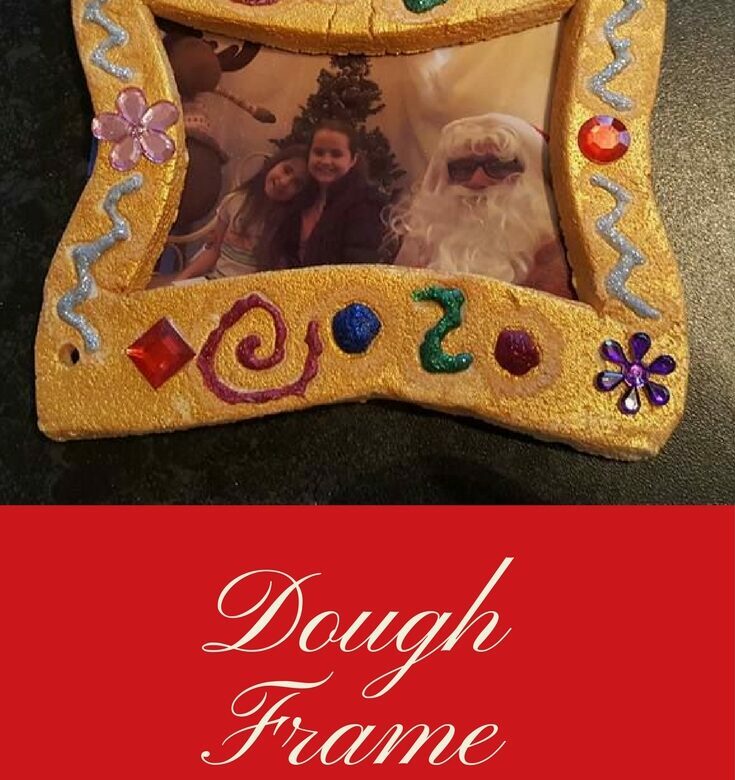 These salt dough photo frames make lovely personalised gifts for grandparents. I’m keeping ours though because I love it too much to give away! Mix all the ingredients until a dough forms. Knead the dough for around 5 minutes to help with the elasticity. Roll out the dough then cut to size. It helps to use a photo to see how big your frame needs to be. Cut out the middle of the photo frame a little bigger than the photo you’re going to be framing. We left our frame to air dry; depending on the size and thickness, this can take 2-7 days. If you want to speed up the drying process, you can dry them in the oven. Spray the frame gold and leave to dry. Using the gems, glue and glitter glue, decorate the frame. When the glue has dried, thread the ribbon through the holes and tie at the back. Glue the photo to the back of the frame. Day 20 tomorrow and I’m getting almost as excited as the girls! We’ll be making cinnamon dough tree ornaments.